The girls andI had a few great foreign trips in 2018 including a European cruise and week in the Italian Lakes with Al Fresco Holidays. I’ve been keen that, at the age of five and three, the kids start packing and carrying some of their own belongings, especially as Mr Tin Box couldn’t join us for these two trips. My hands were already well and truly full! So what’s the best luggage for kids to unburden travelling parents? 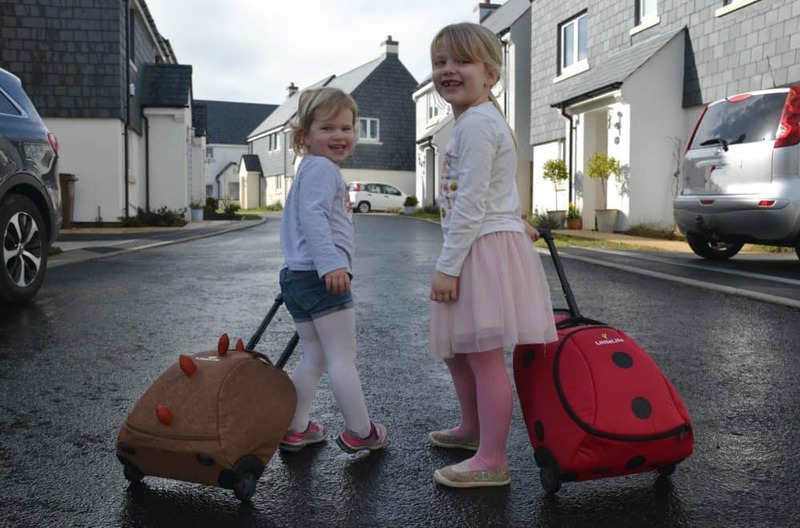 We were sent a pair of LittleLife wheelie suitcases to review. Read on to find out what we thought of these cute kids duffle bags on wheels. If you’d like read more product reviews subscribe to my newsletter for regular insights from our adventures with two children and a dog in the UK and Europe. You can also check out a round up of our top travel tips for families. How does the LittleLife wheelie suitcase compare to other luggage for kids? In order to put our Ladybird and Dinosaur* design LittleLife wheelie suitcases through their paces prior to going on holiday I thought I’d challenge the Tin Box girls to pack them for a five night trip. I chose five nights as that’s the average time we’re usually away from home. I supervised Baby while Tot filled her own bag with five jumpers, three pairs of trousers, a swim suit, one pair of shoes, one t-shirt and two pairs of knickers – the ideal holiday wardrobe, ahem! She also popped in a story book and her favourite, well-loved cuddly toy. If you’re interested in packing lists take a look at my self-catering holiday packing list or my essentials for travelling with a baby and toddler. So how did the LittleLife Wheelie Suitcase stand up to our five night challenge? We managed to get everything we needed for each of the girls into the 20 litre bag and had space for an extra couple of nights with some tight rolling and clever packing. I’d definitely use these suitcases for a summer holiday. If we needed wellington boots, extra jumpers and spare waterproofs then the girls would have to borrow some luggage space from me. I had intended to put Tot’s wheelie suitcase into the aeroplane’s hold during our flight to Italy in the summer. But some unplanned repacking meant we brought it into the cabin instead. This was no problem on our flight with Flybe, which restricts cabin bags to 55 x 35 x 20cm. The suitcase fitted perfectly under the seat in front of ours. To be honest the bag is deeper than 20cm, but because we had other luggage going into the hold I don’t think the check in staff were too worried either on the UK or Italian sides. Other airlines may not be so accommodating! We also have Trunkis and the girls love them too. However, as someone interested in how useful the luggage is rather than just its entertainment value, I much prefer the LittleLife wheelie bags. You can pack them and re-open the bags without everything falling out, which means you can use them more for longer breaks. It’s not just a novelty – however useful that is when you are trying to keep kids amused at the airport. The prices are similar if you buy them through the official brand websites. But it is possible to pick up Trunkis for cheaper*. My vote for the best kids luggage still goes to LittleLife. The girls think these animal-themed suitcases are great fun and were keen to give them a road test. They had no trouble dashing around with the bags fully loaded with their well chosen (and not so well chosen) holiday essentials. I rate the LittleLife Wheelie Suitcases because they are practical with an element of fun and we can pack them like proper luggage with clothes and a few items to keep the kids entertained while we’re on holiday. I might actually win back some of my suitcase space! In terms of the bags’ price (RRP £49.99), the LittleLife Wheelie Suitcase* is a bit more expensive than other luggage for kids on the market but I would argue it is more practical and comparable with good quality adult hand luggage. 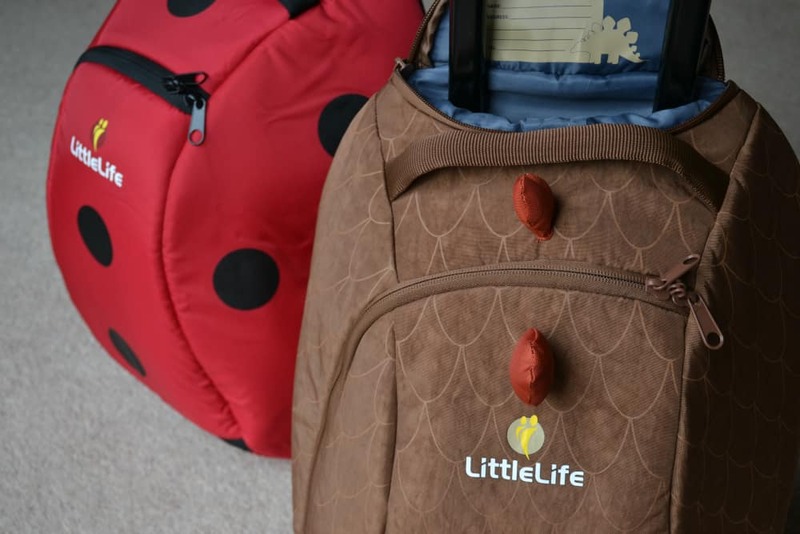 Top tip: you can sometimes find LittleLife luggage for kids cheaper on Amazon! Do you have special luggage for your kids? Disclosure: we received our own LittleLife wheelie suitcases for free in exchange for an honest review. All opinions are my own. This post also contains affiliate links. This means if you click on a link marked with a * and make a purchase then I may earn some commission. This does not affect the price you pay. They are both so cute but my daughter would probably choose the dinosaur! I cannot believe the amount of stuff you managed to pack! Incredible! I like the Ladybird design. She would like the ladybird. My daughter would pick the ladybird but my son would love the dinosaur! I think my boy would like the dinosaur. Can’t believe how much fits in them. Either would be great it saves me trying to lug 5 kids suitcases and gives them a sense of pride that they can be grown up enough to carry their own. My 3 little ones would love to pack everyone’s swimming stuff into it for our holiday. My grandson would love the Dinosaur suitcase, he really into all the big beasties at the moment. I think the dinosaur would really suit my nephew. Probably the Dinosaur, thank you. I think they would pick the ladybird as red is the favourite colour! We loved the ladybird one so would choose it. Cannot believe how much you packed into it – amazing! I think my daughter would love the ladybird! My daughter would love the Ladybird design. We travel a lot because of my husband’ job and are forever on trains and planes this looks absolutely ideal. Many many thanks for this great review and giveaway. Thanks for the review – they look like top bags! I’ve been looking for decent luggage for our little ones. The ladybug one is so cute! Kim Carberry recently posted…Dorco EVE 6 razor – Review! My little grandson would love the dinosaur one. My youngest would choose the dinosaur, she loves them! i love the ladybird one! She would choose the ladybird I think. Thanks for a lovely giveaway. How lovely. I would choose the ladybird model. I think that my little granddaughter would love the Ladybird design best. The dinosaur would be my son’s choice. My daughter would choose Labybird. I am surprised at how much they fit in. My niece would so adore the Ladybird one as so cute. I would love the Ladybird design for my granddaughter. My son would love the gruffalo one. He loves the books and it looks fab! I think my grandchildren would prefer the dinosaur! Milly would love the ladybird. both look awesome! The Ladybird would be great for our little Grace. Oh for sure they would love the dinosaur, it looks fab !! Great review – love the ladybird case! Aww… they’re so cute! Kids just love to have their own personal case when going on holiday. These are perfect! My nephew would love the Dinosaur one. Wow, they’re so cute! Kids love to have their case when going on holiday. These are excellent!